The Euro extended its weekly gains to 1.1283, but closed the day unchanged at 1.1262. The Dollar was under selling pressure throughout the first half of the day as traders were still digesting President Trump’s new tariffs of $11B on EU products. Traders are also cautious from today’s ECB and FOMC monetary policy meetings, as both Central Banks turned dovish from their previous meeting. 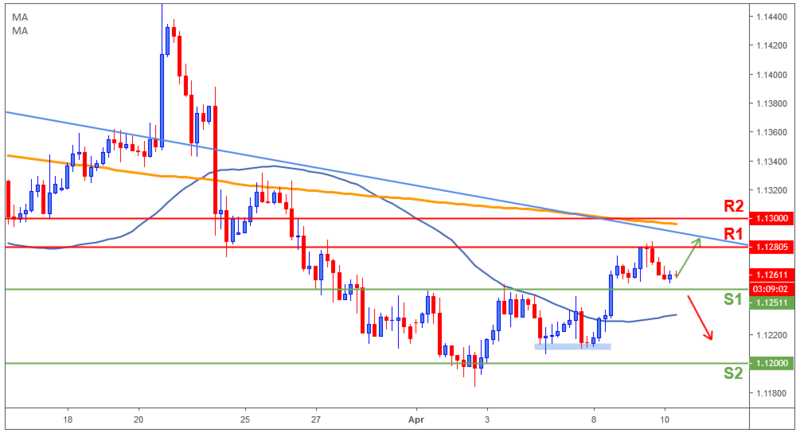 Market sentiment is already bearish on both currencies, but the Euro will be under more pressure if the ECB expresses any steepening concerns regarding the economic outlook. In contrast, the FED would surprise negatively only if it hints any chance of a rate cut. Alongside these events, EU representatives will have an emergency summit to discuss a possible Brexit extension, while the US will publish March inflation data. The Euro tested 1.1280 (R1) yesterday as expected, but failed to break above it, price pulled back and closed at 1.1260, just above our support area 1.1250 (S1). Momentum is still with the bulls, as 1.1280 (R1) retest is a very likely scenario for today. However, if price breaks below 1.1250 (S1), we could see a shift in momentum and the common currency could weaken and fall towards 1.12 (S2).